This Stockholm adventure was turning out pretty awesome, not withstanding a hotel room the size of a matchbox. 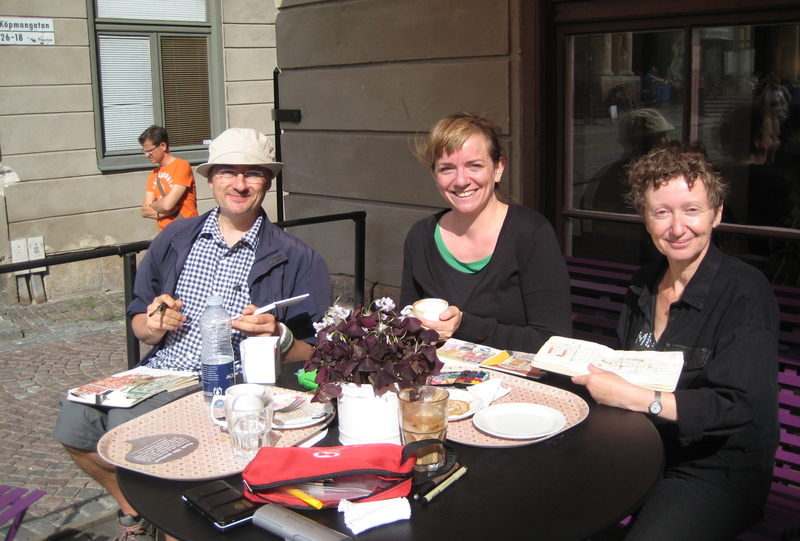 But it reached a new height on August 19 when I met with Nina Johansson to sketch in Gamla Stan – the Old Town. This is Nina in the sketch! We found this little passageway where we could reach the opposite walls if we extended our arms to the sides. We hoped we would not be disturbed by hordes of tourists. We were wrong. Apparently this was a very important alley and FOUR tours traipsed over us in half an hour we spent there. They were VERY excited to find us there and took numerous photos of us. Two of the tours were English speaking, one Russian, and one – unfamiliar language. One of the tour guides shared that she lives here in Gamla Stan. The basement of her building is very old indeed – 12th century. Her actual building is much more modern – 1600’s. Just imagine! From another tour guide I learned that this alley – Skeppar Olofs – was already built in 1587, that’s the first known mention of it in the records. It was named after captain Olof who was an important figure in Swedish Navy. The reason Nina and I only had a half an hour in Skeppar Olofs Grand was that we were meeting Ed Harker at Stortorget – the Big Square. Ed is a sketcher from Bath, England. It turned to be a truly international sketch-meet. We had a great time sitting in a cafe and sketching Stortorget. My view was Swedish Academy and Nobel Museum – the very place where they decide the Nobel prizes every year since 1901. Thanks for all the info on Sweden. I find it fascinating that someone’s basement can be from the 12th century. Your sketches are great, as always, Alex. Stockholm exceeded my expectations – it is so beautiful. And so amazingly old. It escaped the recent wars that inflicted devastating damages to most European cities. The last time Sweden was involved in war the year was 1812, and war was with Napoleon. Thanks for the comment, Carol! Great sketches. It’s lovely reading about your adventure. Thank you, Sue! I have spent quite some time on your blog pouring over you illustrated adventures – what a treat! Friends, check Sue’s blog – Art of a Nomad – for beautiful drawings and stories. Thank you, Debra! I am trying, with colors. Stockholm is different in terms of colors. It took me a little to adjust, I am better with these sketches. Wonderful, wonderful post. Thank you for sharing.